One of the things that I love doing with leftover risotto is fry it. I always cook more risotto than I need so that I have some leftover the next day to make into fritters. 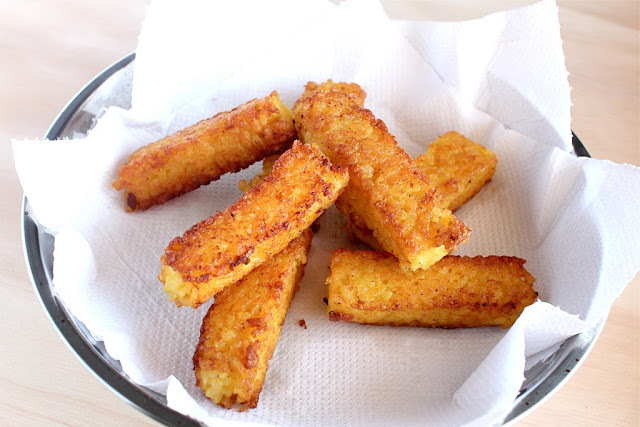 But this time, instead of making fritters, I thought that it would be cool to try frying up some little batons of risotto. To get the risotto into the shape that I wanted, I left it refrigerated overnight flattened in a baking tin lined with glad wrap so that it would be easy to get out. As risotto cools, it will turn starchy and glutinous, become firm and stick together. 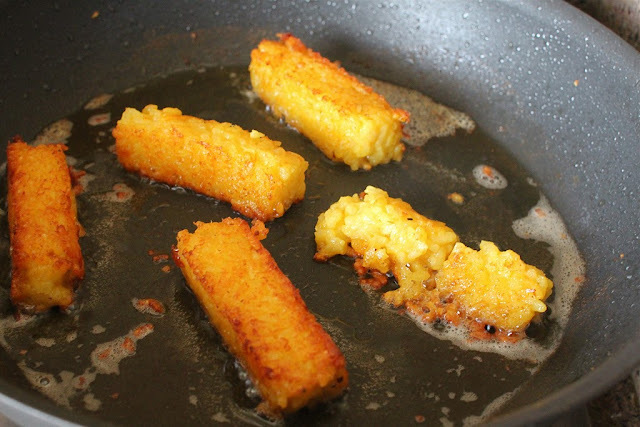 The next day I sliced the risotto into 1.5cm x 5-6cm rectangles and pan-fried them in butter until they looked like pieces of thick chunky chips! The outside was crispy, while the inside was soft and creamy, resembling the risotto’s original state. 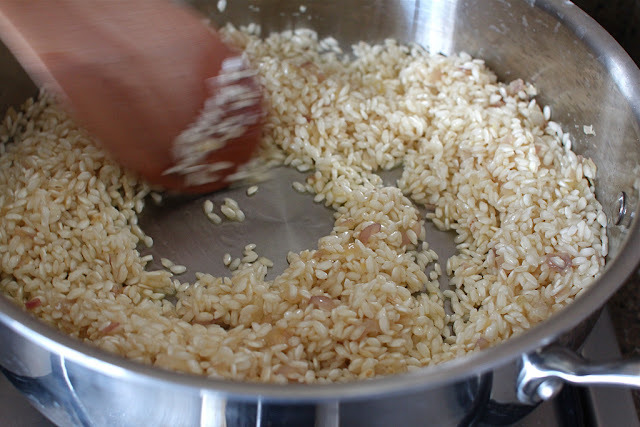 Be careful with handling the pieces of risotto, because as you turn them over to fry evenly on all sides, some will crumble. 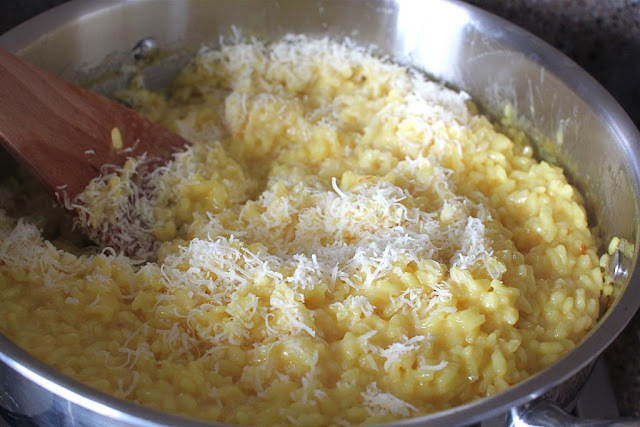 To minimize crumbling risotto, I think that next time I need to compact the risotto more tightly together in the baking tin or add more parmesan cheese in the mix so that it will stick together better. 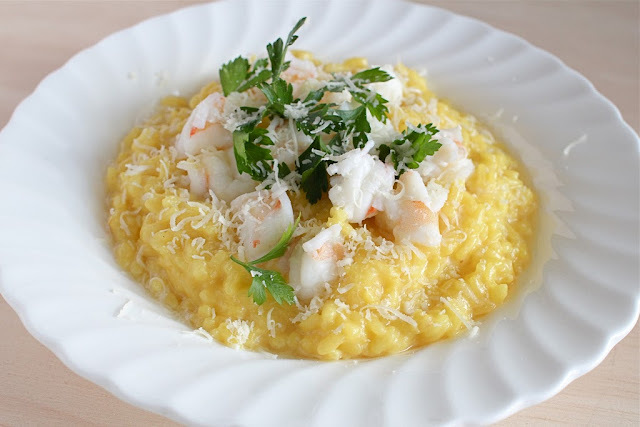 The risotto that I made was saffron risotto, I was aware that Risotto alla Milanese is a very traditional Italian risotto dish, often lauded as simply the best and I wanted to try cooking it to see what made it so special. I followed a recipe by Giorgio Locatelli from his Made in Italy: Food and Stories which is one of my favourite Italian cookbooks. 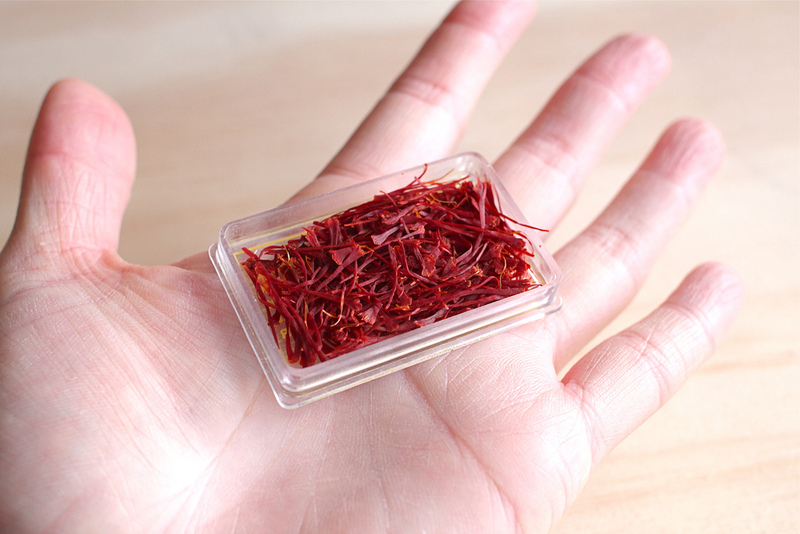 Locatelli states in the headnote to the recipe that “I don’t know what it is about saffron and rice that make them work together but they are natural partners…”. I didn’t know what to expect as it’s a really simple recipe using just a few ingredients but I loved the combination of saffron and risotto, not only does the flavour of the saffron shine through but it gives the risotto a lovely golden yellow hue. To give the dish something a little bit extra so that the risotto wasn’t just naked and on it’s own, I added some poached prawns on top (I always have a stash of frozen prawns in my freezer) and garnished with parsley. Heat up the stock in a pot. 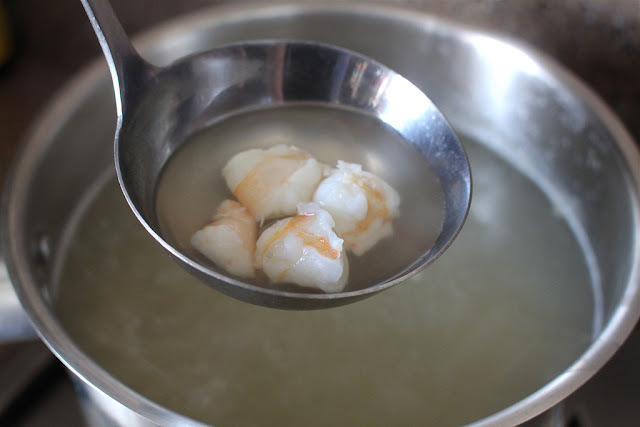 Shell, deveined some prawns and chop into small pieces. Add the prawns to the boiling stock and poach, when they are cooked through, spoon out and set aside in a bowl. Melt 50g of butter in a heavy-based pan and add the chopped onion. 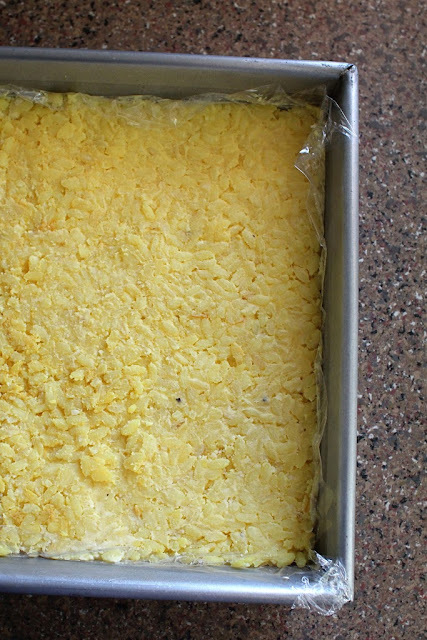 Cook gently until softened, but not yet coloured (5 minutes). Add the rice and stir to coat it in the butter and ‘toast’ the grains. Make sure they are all warm, then add the wine. 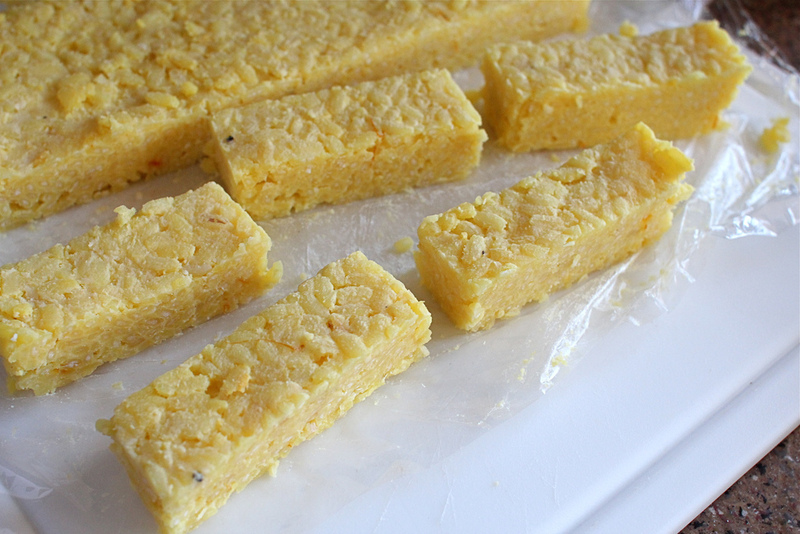 Let it evaporate completely until the onion and rice are dry, then add the saffron. Start to add the stock, a ladleful or two at a time, stirring and scraping the rice in the pan as you do so. When each addition of stock has almost completely all evaporated, add the next ladleful. Carry on cooking for about 15-17 minutes, adding stock continuously and stirring frequently to prevent it from sticking to the bottom of the pan. After about 12-14 minutes, slow down the addition of the stock, so that the rice doesn’t become to wet and soupy, otherwise when you add the butter and parmesan at the end, it will become too soupy. The risotto is ready when it looks creamy and the grains are soft but still al dente. Turn down the heat and allow the risotto to rest for a minute. Use a wooden spoon to vigorously beat in the 75g of cold diced butter and then add the parmesan and beat in. Season to taste and serve with poached prawns scattered over the top and garnished with parsley and grated parmesan. 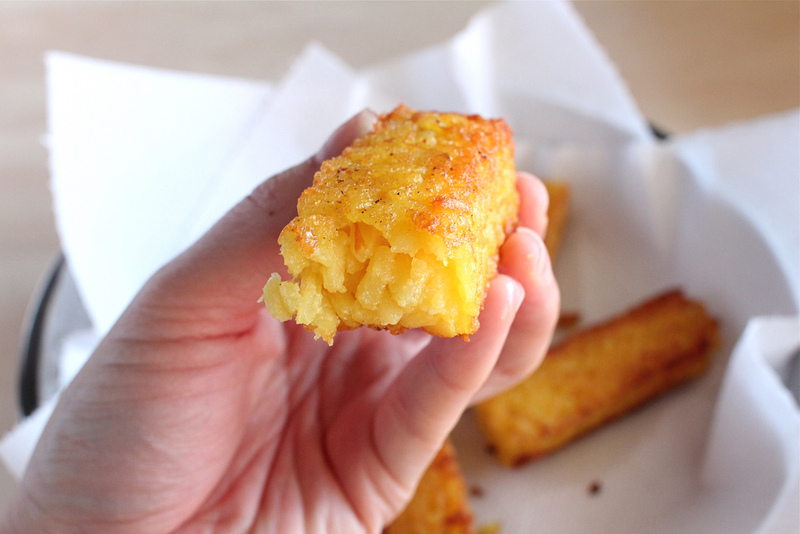 It's like an arancini ball made sweet love to a polenta chip but turned out so much better. This is some KILLER innovation girl. The risotto looks so wondrously creamy. I can just imagine how awesome it would be as chunky chips. Very clever idea! Thanks Martine :) It was a little experiment and I'm glad they turned out well! I've often made arancini from leftover risotto but these batons are perfect! I've also made saffron rice but not risotto. So much to try!